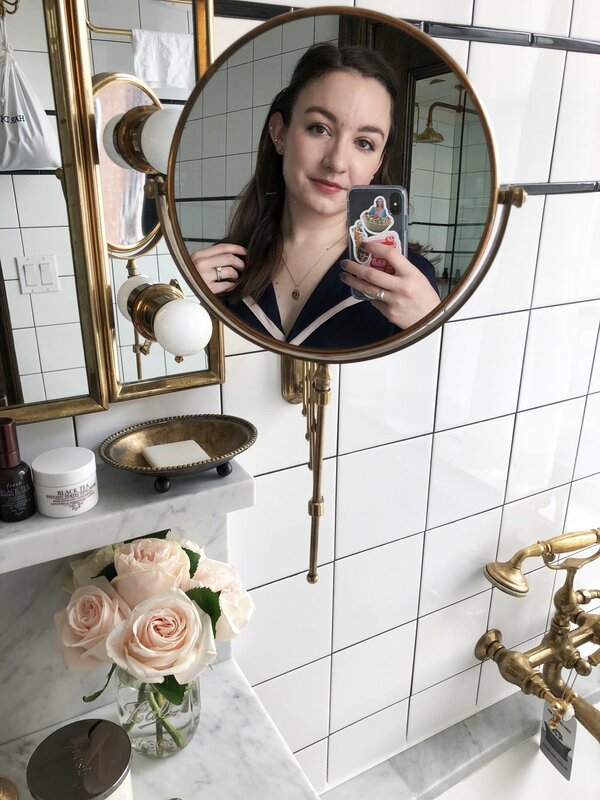 I definitely go through phases with my beauty routine - there will be a few weeks where I change up the products I'm using almost daily, and then there are some weeks I stick to a core routine. Lately I've definitely been into the "core routine," mentality. When I'm trying to get as much sleep as I can, I'm going to pick products that I know not only work well but also work well with other products. These products help make both my nighttime and morning routines quicker, so more time laying in bed for me. Fresh Rose Deep Hydration Facial Toner | The packaging and the fact that there's real rose petals floating around in this toner really drew me in, but I've found it's a fantastic product. It feels so soothing and hydrating on the skin - it really helps to tone down my redness and prep my skin for the rest of my routine. Everything just seems to sink in so much better when I've used this, so it makes my skincare routine move right along. After a few weeks of consistent use, my skin is smoother and more plump. Biossance Squalene + Vitamin C Rose Oil | This is another brand whose packaging drew me in - as soon as I saw an ad for Biossance on Instagram, I knew I needed to pick something up to try. I went for their facial oil, because you can never have too many facial oils, right? This one is lovely - it's quite lightweight and sinks in quickly (it feels similar to the Indie Lee Squalene Oil). It smells like roses and leaves me with the glowiest skin. The vitamin C really works wonders here and has been helping to brighten my skin, and I've noticed some of my acne marks fading more quickly. Nothing has really made my skin look so radiant before - I'm hooked, and I love using it morning or night. Glossier Birthday Balm Dotcom* (20% off) | I've raved about Glossier's Balm Dotcom since I first started using it over two years ago. It's hands-down my favorite lip balm, and as someone who is randomly sensitive to certain lip balms, these have never given me an issue. I have multiple floating around in different bags, drawers, and coat pockets so I'm never without it. I was super excited when Emily Weiss gave us a sneak peek of the new Birthday flavor in May, and even more excited to finally have it in my hands a couple weeks ago! It's the same super moisturizing formula with the best vanilla cake scent and a bit of subtle holographic shimmer. Because of the shimmer this isn't one I wear to bed, but it's been my go-to during the day. The shimmer also makes it a beautiful highlight - I love dabbing a bit on my cheekbones in a pinch. Revlon ColorStay Creme Eyeshadow, 'Praline' | I just mentioned this in my Makeup Lately post last week, and it's definitely a hidden gem of the drugstore. Everyone sings the praises of the Maybelline Color Tattoos, but this one from Revlon performs better on me. Praline is the most perfect shade for me - it looks like a little bit of rosy dew on my eyelids. These babies stay put too - I usually can't wear anything without a primer, but even when used on their own they don't crease! I need to go pick up another shade or two - any suggestions? BECCA Sunlit Bronzer, 'Bali Sands' | This was an impulse buy, but probably the best impulse buy of my life. I really think this has become my favorite bronzer of all time. The formula is beautiful and buttery, it's pigmented enough to show color on the skin, but not so pigmented that it creates brown stripes on your cheeks. It has a little bit of shimmer (it has some of the shimmering skin perfectors mixed in), but on the skin it translates to a really natural-looking radiant glow. I have the lightest shade and it's absolutely perfect and impossible to overdo. It comes in five shades, which I feel like is a good range for bronzer. If you're in the market for a new bronzer this summer, definitely check these out. Nudestix Gel Color Lip + Cheek Balm, 'Wicked' | I've been on a real Nudestix kick lately. All the products seem right up my alley since I love a bit of effortless makeup, and Nudestix does it so well - the products are so easy to use and yet stick around all day. Through the BabeBoss Faves Box I tried the Gel Color formula and instantly fell in love. It's a sheer, balmy (obviously) formula that feels hydrating but not greasy. It works beautifully on both the lips and cheeks, especially if you're going for a dewy look. I recently picked up the shade Wicked, a sheer berry red, and I haven't been able to stop wearing it. It's so flattering and adds just a hint of color that really adds life to the face. It's perfect for mornings when I've literally dragged myself out of bed. It's just the cherry on top of a fresh, natural makeup look.